The defending counsel Barrister Ejiofor, stated that he was ambushed by sending a new application this morning. The Nigeria State case,reacted to the word "Ambush",by saying the application is not harmful. The presiding judge,demanded that the Nigeria counsel should understand what the defending counsel referred to as "Ambush". The judge stated,he was not referring to military ambush,but how the application was surprisinglt sent to him. On that note,the Barrister Ejiofor stood on his grounds to further state that,such application is not acceptable. The Nigeria Government filed for a new application, for a LEAVE not an adjournment. Power went off and the defending counsel Barrister Ejiofor, was asked to halt his argument,until power is restored. 12.10 Court proceedings, commenced after the break. He urged the honourable court to dismis,the new application against the defendant. He quotes article 87 sub 5,to hear this objection together with their notice. He stated that the defendants, have being grossly violated by the Nigeria Government and further delay of the case,will not be accepted. He pleaded that the court should hear the case and dismisses it today. The Nigeria counsel stated that, their preliminary is focused the outcome of the Nigeria court of appeal. The presiding judge stated that,the Nigeria counsel ought to have properly sent an application before today's court proceedings. He was stopped by the presiding judge, who asked why he couldn't file the application from October 5 which is about Five months, upon till today. This resulted to a general laughter, in the court. The Nigeria counsel quoted article 72 in paragraph 2,that it is on the preminary objection which their new application is based on. He further stated that,they have the right to file the new appeal,in other to amplify their evidence against the defendants. The prosecuting counsel, states that the document in other words application, was filed yesterday when the hearing has not commenced today. He went further to speculate that, the defendants have a body language for delay, as they were the first to start up the delay tactics. The prosecuting counsel referred to the first case which was heard in ECOWAS court, where he cited a case was adjourned, due to an oral application. Thus, he pleaded that the case should us be dismissed and the judge should consider it an oral application. The prosecuting counsel referred to the first case which was heard in ECOWAS court,where he cited a case was adjourned, due to an oral application. Thus, he pleaded that the case should us be dismissed and the judge should consider it an oral application. The prosecuting counsel, was allowed to read out the application, by The prosecuting counsel stated, "My Lord, this ECOWAS court lack the jurisdiction of this trial. This court should not hear this case”. the defending judge. Affidavit of completion of investigation, surrounding this matter he also seeked to allow all the evidences, attached to the Case be seen. He also pleaded that, the judgment of the Appeal court should be attached to the Case. The prosecuting counsel refers to two Nigeria municipal courts that refused to grant the defendants bail. The High Court and Appeal court, He stressed on the two courts, not granting the defendants bail and as such should not be granted bail. 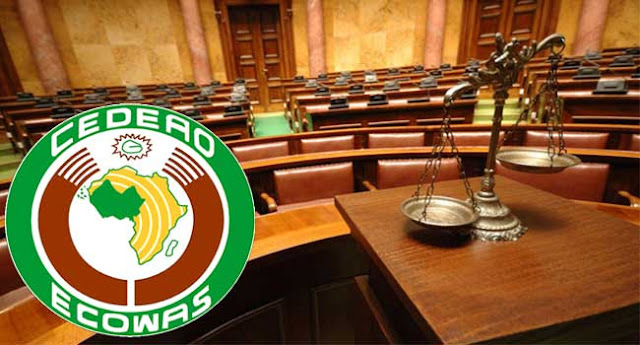 He stated more that, while awaiting the judgment of the court of appeal, the defendants "Ran" to the ECOWAS court and did not disclose that, two courts have refused him bail. He went further to state that, the defendants refused to let ECOWAS court(Trial Court) know of reasons why he was refused bail in two Nigeria courts, because he knew "He will be driven away". He quoted Article 6 of African charter and told the court,Ecowas court have no power, to hear such criminal case. He went further to demand that, the case should be dismissed. That ECOWAS court, is not an appellant court, but a supervisory one over the Nigeria municipal Court. He referred his Lordship to the case between Asari Dokubo and the Federal Government of Nigeria. He cited the article on 2007,which he read out. The argument of the prosecuting counsel just ended. The second presiding judge demanded that the counsels should put on their English translation devises, because he will be speaking in French. He spoke in French and the translator, did the translation. The defending counsel is now allowed to argue the new application by the prosecuting counsel. The defending counsel argued" My Lord we humbly submit that bringing the present application by the defendants, under sections 161 sub 1 and 2,section 241,262 of the criminal Justice act 2015,is legally faulty. "My Lord this court, is a sub region court, which does not derive it's powers ore jurolidiction from any of the domestic laws. The court powers is contained in the 1991 act and that of the supplementary of 2005. The defending counsel, stated that access to the court is open to individuals of cooperate bodies, which violates the right of individuals. He also referred to Onwo vs Nwafor Okoh,case. The defending counsel, reffered the presiding judge to 19 of November 2015, when the defendants were granted bail and court order was not obeyed. Barrister Ejiofor pointed out the announcement of the President Media speech, where he stated he won't release the applicants. On that note,the applicant became a political prisoner,hence the he lost confidence in the Nigeria municipal courts. Following the announcement by the President,it became obvious that,the President presides over the Nigeria judiciary. Still on the argument by Barrister Ejiofor,he stated that not granting his clients bail,is a gross violation of the right of the citizen of a member state. He cited a case in 2006, between Gani Fawemi and Abacha. He also stated that, the right of the plaintiffs has being violated, by the Nigeria Government. He debunked the defending counsel, for comparing Asari Dokubo and the Leader of IPOB, because IPOB is a none violent group. He sighted laws guiding the right to Self-Determination. The defending counsel was countered by the presiding Judge, because he was previously given over 30minutes to make his arguments and shouldn't argue further. He demanded that, the court should indulge the two counsels to argue and it was granted. The Nigeria counsel stated that, the Dasuki Cass,is different. He argued that, Citizen Nnamdi Kanu was never granted bail and was kept in the prison by court order. The arguments by the two counsel, just ended. The court case has being adjournes,to 9th day of February. ...Truth can never be hiding or defeated. More grace to you our amiable leader His Excellency Nnamdi Kanu.